Rishikesh, the birthplace of yoga, is a popular place to meditate, do yoga, and learn about other aspects of Hinduism. It's situated on the banks of the Ganges River, surrounded by hills on three sides, not far from Haridwar in Uttarakhand. The whole town is considered to be sacred and it’s believed that meditation there leads to salvation. Rishikesh lures those seeking knowledge and peace with its numerous temples, ashrams, and yoga institutes. Despite the growing number of visitors, the town’s lanes and alleys retain an old-world charm, and it remains a wonderful place to relax and unwind among nature. It has a spiritual, international feel. The nearest airport is Dehradun's Jolly Grant Airport, 35 kilometers (22 miles away). The airport is actually closer to Rishikesh than it is to Dehradun! Expect to pay 1,500 rupees upwards for a taxi to Rishikesh from the airport. Shubh Yatra Travels offers a reliable service. However, if you're on a budget, it's cheaper to travel to Rishikesh by road from Haridwar. As Rishikesh is located at the Himalayan foothills, it provides a cool escape during the hotter months. Therefore, the best time to visit is between March and April, and September to October. May starts to get quite hot there. Rishikesh is best avoided during the monsoon months from July to August, as it receives heavy rain. Rafting is also closed during this time. Winters, from November until February, are cold but pleasant, so bring woolens. Many people consider the couple of months just after the monsoon to be the best time to visit, as the landscape is alive, green, and soothing. Rishikesh is a delightful place to wander around and explore on foot. Cross either of the two suspension bridges and you'll be rewarded with spectacular views of the town and river. Venture down to the ghats fronting the river and relax for a while amidst the daily goings-on. You can also take a boat across the river near Ram Jhula as an alternative to walking. Every evening, people gather at Parmarth Niketan ashram (in the Swag Ashram area), to experience the Ganga Aarti (worship with fire). If you're interested in learning about Indian cuisine and how to make it, don't miss the classes offered by Cooking Masala. Adventure lovers also have two good reasons to visit the town -- the excellent trekking, rafting and canoeing opportunities in the area. You may have heard that the famous English band The Beatles visited the ashram of Maharishi Mahesh Yogi in the 1960s to learn meditation. They also wrote around 40 songs there. The ashram is located within Rajaji National Park, and it recently re-opened for tourists after three decades. Its remaining walls have been decorated with amazing graffiti artwork by artists from around the world under The Beatles Cathedral Gallery community project. The entry cost is 150 rupees for Indians and 600 rupees for foreigners. Rishikesh is one of the most popular destinations for yoga in India. There are numerous ashrams, and numerous styles of yoga and meditation, to choose from. Hence, it's important to investigate which best meets your needs. Here are 11 of the Best Rishikesh Ashrams for yoga and meditation to give you some idea of what's available. The main spiritual district is known as Swarg Ashram, and you'll also find plenty of ashrams there, along with food stalls and shops. Ayurveda is popular in Rishikesh. You'll be able to feast on delicious Ayurvedic, organic, and health food. Head to Ayurpak (which also provides homestay accommodations and these fabulous jungle cottages) or Ramana's Organic Cafe. In addition, Nature Care Village is a wonderful organic farm specializing in raw food, yoga, and meditation retreats. You can learn about the properties of various medicinal plants and their uses from experts there too. (Read reviews of Nature Care Village and book on Tripadvisor). If you're keen on getting a professional Ayurvedic treatment, Hemadri Ayurveda Center, Ayurveda Bhawan, and Arora Ayurveda are recommended. Vedic Ayurved also gives some of the best Ayurvedic treatments, including massages, in Rishikesh. Those interested in yoga shouldn't miss the International Yoga Festival, held in Rishikesh in March each year. The week-long festival is one of the biggest annual yoga gatherings in the world. Attendees get to take part in a comprehensive program of yoga classes, and evening discussions with some of India's leading spiritual leaders. There are also vegetarian cooking classes and the Yoga Aid Challenge charity fundraiser. Substantial discounts are usually possible at hotels during non-peak times, so do ask! For smaller hotels, it's best to just turn up. If you prefer to book in advance and stay somewhere reputable, here are 11 of the Best Rishikesh Hotels and Guesthouses for all budgets. The article also contains information about the various areas in Rishikesh, to help you choose where will suit you best. If you're looking for inexpensive accommodations, there are a number of groovy backpacker hostels that have opened up in the area. Check out Zostel and Bunk Stay. Rishikesh is a great place to hang out in an ambient cafe. Cafe de Goa near Laxman Jhula bridge is popular for its view over the Ganges River and a wide variety of dishes including Continental cuisine. The 60's cafe in the Laxman Jhula area has a Beatles theme and music to go with it. On the other side of the river, Chatsang Cafe ("where food meets the soul") offers healthy and contemporary food with a twist. Rishikesh is a holy town, so eggs, fish and meat are difficult to find there. 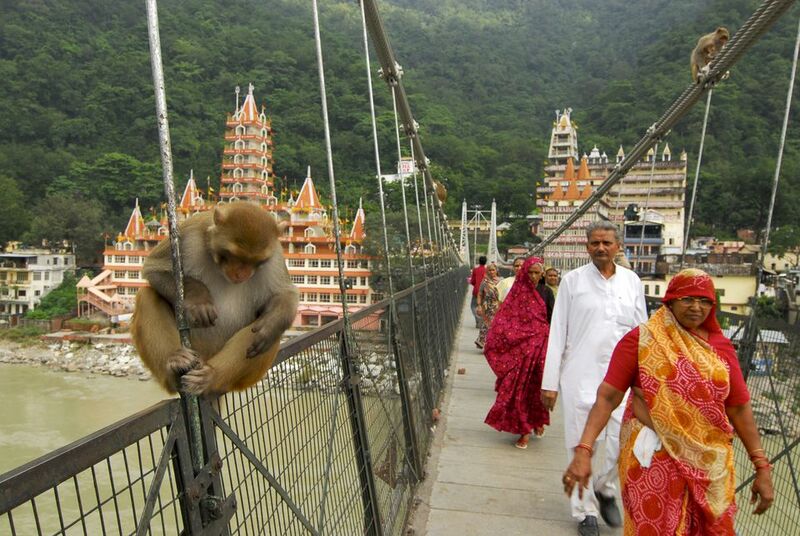 Rishikesh is a great place to shop for religious items, books, clothes, and handicrafts. Try to walk around as much as you can, although auto rickshaws are readily available to provide transport from the bus or train station to either of the bridges. Make sure you watch out for the plentiful monkeys which make quite a menace of themselves, particularly on the bridges. Shivpuri is a highly recommended side trip, especially if you're into adventure. Located 22 kilometers (14 miles) upstream, it's a place of mesmerizing natural beauty. You'll find excellent white water rafting there, with Grade 3 and 4 rapids. Tented accommodations with attached bathrooms, such as those provided by Camp AquaForest and Camp Ganga Riviera, add to the uniqueness of the setting in the middle of white sand beach and jungle. There's also an excellent bungee jump zone on the road to Neelkanth at Mohanchatti village (around 15 kilometers from Rishikesh).